In accordance with the Mayan doomsday calendar, "mutated" neutrinos emanating from the sun trigger spectacular CGI disasters on earth that culminate in a global flood. Semiprepared for such contingencies, world governments scramble to complete a construction project on the upper slopes of the Himalayas: gargantuan cruise ships that will carry an elite remnant of humanity through the forthcoming mega-tsunami. But none of that amounts to a hill of beans compared to the travails of John Cusack, who’s hustling hard to get his family onto one of the arks, win back his estranged wife, and regain the respect of his snippy tweener son. As you might expect with director Roland Emmerich (Independence Day), the movie isn’t a patch on the trailer. PG-13, 158 min. 2012, Play the Game, Pirate Radio and more. Global destruction as popcorn-movie entertainment. The Box, Coco Before Chanel, Endgame, More Than a Game and more. 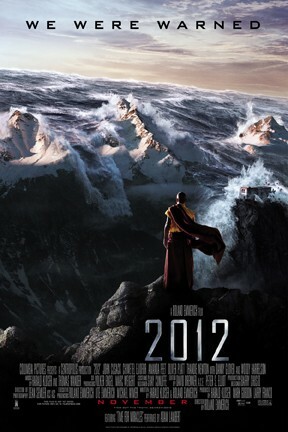 2012 is not showing in any theaters in the area.